We had changed our minds and decided to go to Zion National Park Monday morning. 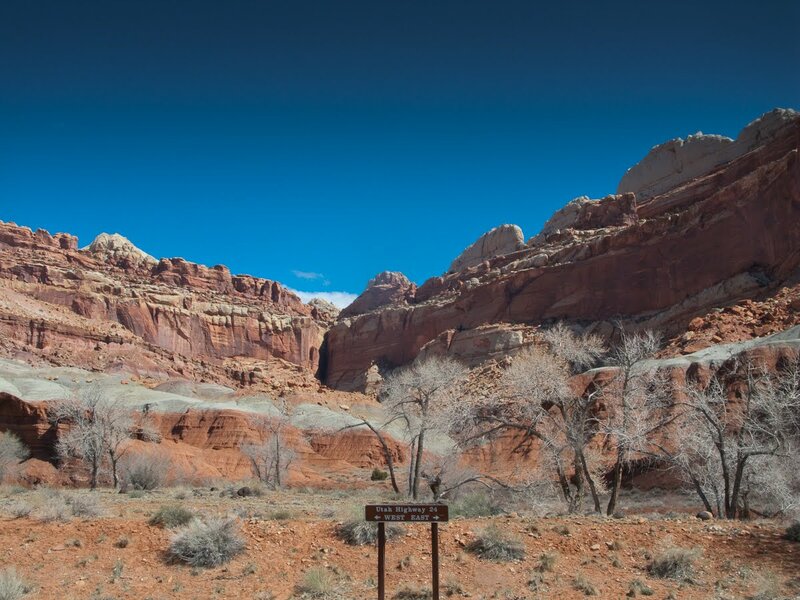 We had even contacted a workcamper at Zion who was going to locate a camping site for us. But the weather forecast called for cold temperatures and snow, so.... we decided it was best to keep heading in an easterly direction. 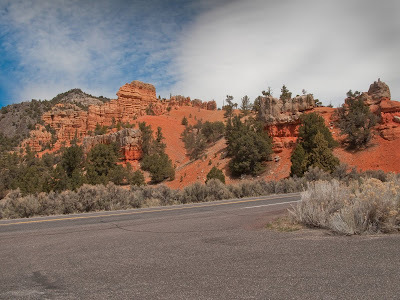 We topped off the fuel tank in Cedar City and headed east on scenic Highway 14 past Cedar Breaks National Monument (not opened yet) and soon found ourselves driving up a mountain pass with 4-5 foot snow banks. Fortunately the road was dry. 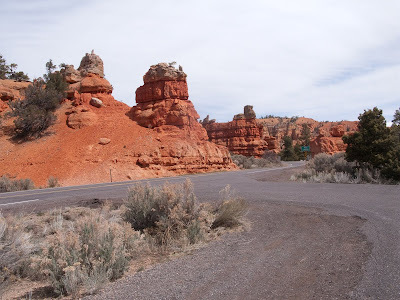 We headed north on 89, then east again on Scenic Road 12 towards Bryce Canyon. 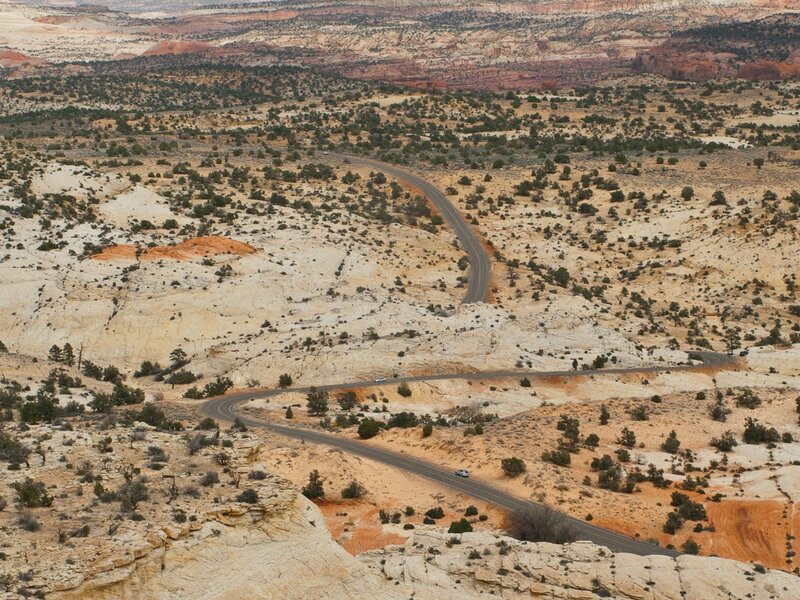 This road is described as one of the most scenic roads in America. It is indeed beautiful but slow going in a 40 foot motor home pulling an Explorer. 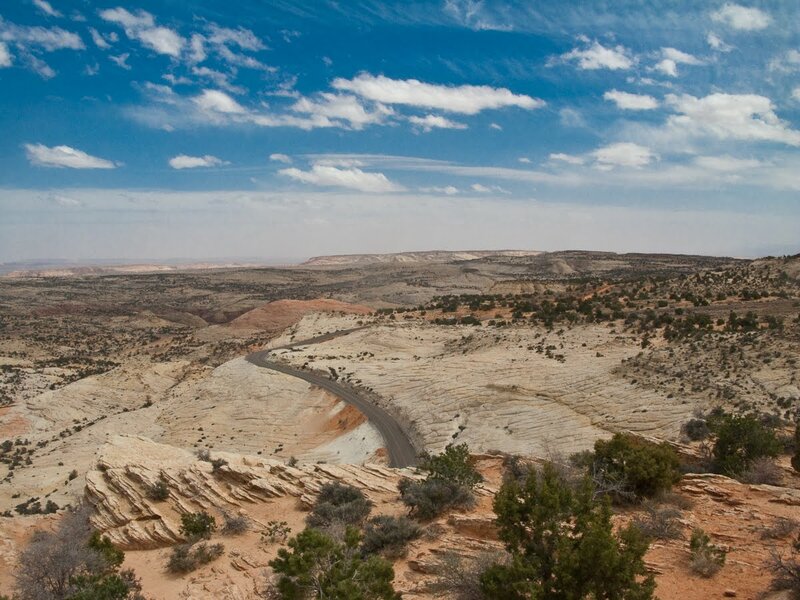 After skirting the edge of Bryce Canyon we soon entered the Grand Staircase-Escalante National Monument. The area between the small town of Escalante and the even smaller town of Boulder can only be described as breathtaking. Breathtaking in more ways than visual. After passing through the Calf Creek Recreation Area we found ourselves driving on top of a ridge with no guard rails and no shoulder on the road, and a 1000 foot drop off on each side. Since there was little to no traffic in either direction, I chose to favor the middle of the road. I have this strange fear of heights, When I get close the edge of something I just want to jump. So I focus on the road and Judy focuses on making sure I'm focusing on the road. This went on for probably a mile before we started down into another canyon. 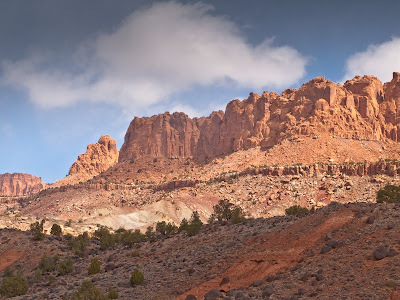 We headed north out of Boulder and climbed up 9600 feet before dropping down into the small town of Torrey, just outside Capital Reef National Park. 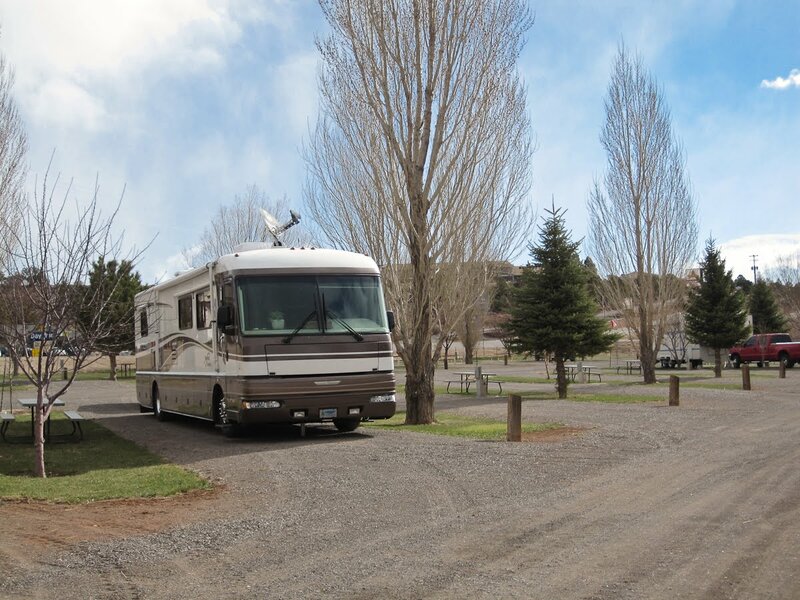 We had been on the road for 5 hours so we decided to spend the night here at the Wonderland RV Park. After checking in and getting settled we noticed that it was starting to snow. It seems the snow had finally caught up with us. 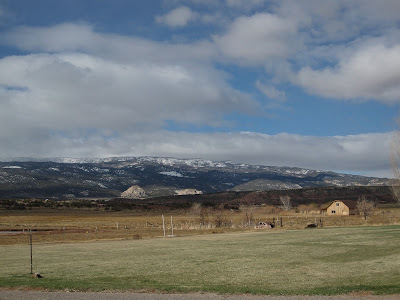 This morning we awoke to chilly but partly cloudy skies but the snow had melted. 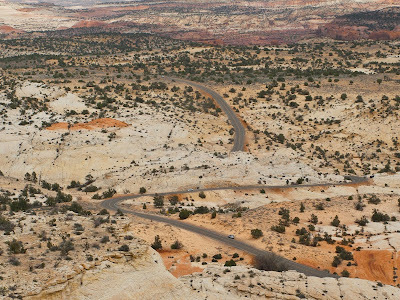 We pulled out and headed east on Highway 24 through the top of Capital Reef. We even took time to stop at the Park Information Center so Judy could get her National Park Passport book stamped. We continued east then north on Highway 95 to I-70 for about 40 miles before dropping back south on Highway 191 for 20 miles to just North of Moab. We plan on visiting Arches National Park tomorrow. I don't think we have ever seen more dramatic scenery. This is truly a breathtaking area.